Southern rockers THIRD DAY show no signs of letting up in their amazing, hard rocking career. Tony Cummings reports. A gigantic amount has happened since 1994 in Marietta, Georgia when Mac Powell and Mark Lee played in an acoustic Christian group at a youth event and there met up with Tai Anderson and David Carr and formed a rock band they called Third Day. With a southern fried rock sound and influences from acts like Hootie & The Blowfish and Pearl Jam the band recorded an album in 1995 for the tiny Georgia independent Gray Dot. Within a year the band's national debut 'Third Day' was pulling in the sales for Reunion Records and by the time the group joined Essential in 1999 they were established as one of CCM's major hitmakers with such recognition as three Grammy Awards and 21 Dove Awards. Now the first of a two volume retrospective 'Chronology Vol 1 (1996-2000)' has showcased the band's fascinating history with as well as 17 audio tracks the package also featuring DVD footage of the band's early days. 'Chronology Vol 2 (2001-2006)' is slated for release this autumn. The band's gritty-voiced lead singer Mac Powell reflected in Billboard magazine on the band's history. "When the first album [1996's 'Third Day'] sold 200,000-250,000 units, I don't think we realised at the time how much of a big deal that was. If someone does that now, it's a big deal, but back then when the market wasn't that big, it was even more than a big deal. You don't see a lot of new artists come out and sell that much. It's a rare thing. The success of the first album helped us build our fan base. In 2001 we won five Dove Awards. That was a big validation for us. We'd won a few Doves before, but that was when we won artist and group of the year for the first time. Then, having our first AC number one - 'I've Always Loved You' - from the 'Time' album, was a landmark for us. Of course, the release of 'Offerings', which went platinum, is also a huge landmark for us." Powell was asked what make 'Chronology' different from other greatest hits packages. "It features a lot of video content, including footage from one of the early shows where it's just me and Mark playing. Also included is the first time David played with us as well as the first time Tai played with us. I've been working hard for years to get rid of these videos, and now the record company has put them out in front of everybody [laughs]. We also went in and remixed most of the songs from those first five years. They sound much better now. And we recut 'My Hope Is You' and 'Thief'." Was there a particular reason for re-recording some of their classics? "[Producer] Monroe Jones was a huge part of the success of Third Day. It was great to get back into the studio with him and work on songs that we've been playing in concert for years. It gave us the opportunity to approach them in a different way. We wanted to see what they would be like if we did them today." Third Day have one of the largest and most high-profile fan bases in the whole of Christian music and are very much involved online. Known as 'the Gomers', they've been referred to by Powell himself as "a grassroots marketing team." The singer explained the origins of the Gomers name. "They got that from our second record, 'Conspiracy No 5'. There's a song called 'Gomer's Theme' and it comes from the book of Isaiah in the Old Testament. It's a story about the prophet Isaiah. God asked him to marry a prostitute named Gomer and so it's kind of an analogy. . . Isaiah loved Gomer. God loves us with an amazing grace and mercy, despite our sins. That's where they get the name. One of our fans started it on the message boards." 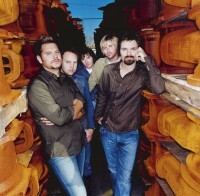 Following the gigantic success of the band's praise and worship albums 'Offerings' (released in 2000 and 2002), last year Third Day surprised many by releasing 'Christmas Offerings'. Max explained the reasoning behind the album in CCM magazine. "We never put a lot of thought into doing a Christmas album. In the first place, we're a rock band. We didn't know what kind of Christmas record we could make or whether it would be any good. In the second place, it wasn't by any means a record we had to do. It was certainly not a record that helps us contractually, so when you look at it from a business perspective it probably is not even a wise thing to do. But over the past couple of years we've had so many friends and fans ask us to do it, and since we like to provide our fans with what they want, we said, 'OK, let's take a shot at it.' When it comes to Christmas, people want to hear songs that they know and like, and they want to hear them in ways that they are familiar with. I'm the same. When I listen to Christmas music, I want to hear the melodies of the songs I grew up with. I don't want a big departure from that." Powell is pleased with 'Christmas Offerings'. "I think we found a great balance. We wrote four new songs for the project but it is most traditional music; songs that people know with melodies they can sing along with. Musically I think we bring a breath of fresh air to the songs. But as trite as it sounds, Jesus really is the reason for the season. We all have families now, and there are 14 Third Day babies. I've got three kids of my own, and when you have children, it makes Christmas even more special. We have an obligation to teach them about the true reason we are celebrating Christmas. It is a time of celebration, but it is also an opportunity to teach our kids about not only receiving but about giving." Powell recently stepped outside Third Day to record the 'Glory Revealed' album, working with evangelist David Nasser and with guest singers such as Michael W Smith, Mark Hall, Shane & Shane and Brian Littrell. The whole Glory Revealed tour has now been impacting big audiences across the USA. Mac spoke to Billboard about 'Glory Revealed'. "First, we got a majority of the lyrics from Scripture. Musically, it's a lot different than anything I've ever worked on. It's an acoustic, very organic record, almost bluegrassy in a sense. It uses a lot of fiddle, banjo and acoustic guitars. It was great as a musician to be able to step out of the comfort zone of a rock band and to do something different musically. We thought it would be so great to go on a tour. We called up some of the artists who sang on the album and said, 'What do you think about April?' They agreed." Another surprise initiative for Third Day is the independent film Facing The Giants. An American football drama made with a volunteer crew for $100,000 the film has since grossed more than $2 million at the box office and is selling well on DVD. Much of the film's success has been credited to the background music which includes a couple of songs by Third Day. Said Powell, "I grew up with the guys who made the movie. We went to church together for a number of years. Stephen [Kendrick] and I used to be in a prayer group together and I did a lot of growing, spiritually, with Stephen in that prayer group. Now to see them be able to do this and for us to be a small part of it, is just an honour. That scene where he makes the guy carry his buddy on his back - man that was powerful." Powell was asked to what he attributed Third Day's longevity. "We've been very blessed. But beyond that, there are a couple of reasons. Rock music is three chords and a good melody. Because we do that, we reach a broad fan base in age and background. Also, I think people realise that we're normal guys and not rock stars. We're very humbled to be able to do this. I think people see that we're genuine guys who want to share our faith through our music." an interesting note...if it wasn't for Third Day's song, FACING THE GIANTS would never have been released in theaters. The filmmakers went to Provident Label Group to get permission to use the song in the movie. They were so moved by the film, they asked their parent company, Sony to purchase the rights to theatrical distribution. The theatrical gross was over $10 mill. in the states, more than 2 mill DVD's have been sold, it has been released in 56 countries on DVD, and over 7000 churches have shown the movie stateside as an evangelistic outreach. Free copies of the DVD are being sent to army units overseas to those who request it. the Church now has signed a 5 picture deal with Sony and begin pre-production on Fireproof in July. Thank God for Third Day!